I watched with anticipation as Clay Aiken took the stage of the New Amsterdam Theatre on May 24, 2004. Joining the talented Heather Headley, the two artists sang a wonderful rendition of Can You Feel The Love Tonight from the Lion King. Heather was born and spent most of her childhood on the beautiful Caribbean island of Trinidad. The daughter of a pastor, she started singing and playing the piano in the church at a very young age. Heather won the role of Nala in the original Broadway cast of the Tony winning musical The Lion King. She then originated the title role in the Broadway adaptation of Aida. Being the mother of two young boys keeps Heather busy, but she has continued her musical career with 4 CD’s, a year in the West End of London to originate the leading role in a musical adaptation of The Bodyguard…plus many tours and awards. In May, 2016, Headley took over the role of Shug Avery from Jennifer Hudson in the recent Broadway revival of The Color Purple. The show closed on January 8, 2017. What an accomplished lady! 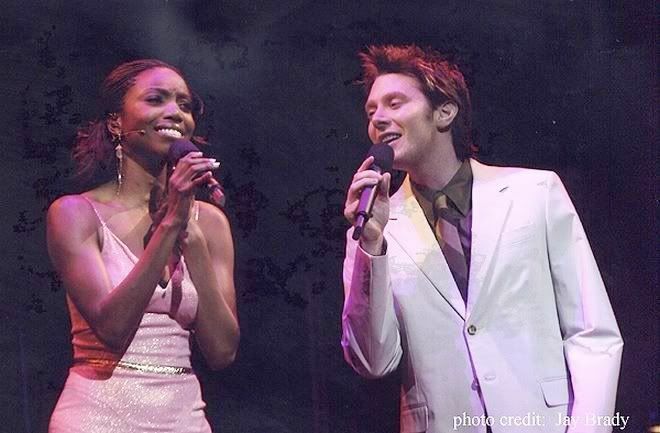 I am certainly glad that she chose Clay Aiken to sing with on her concert to support Broadway Cares/Equity Fights Aids. This was Clay’s first performance on Broadway!! Two great voices blended together for a spectacular performance! Thank you, CANN for sharing! Thanks for the info on Clays first broadway appearance. There can never be too much Clay info. Checking out CANN while I’m waiting for a PET scan this morning. Thanks for the distraction. ❤️ UNCONDITIONAL love for you Clay. How exciting to see Clay on Broadway again! Clay has made many friends in theater and TV. I hope there are many more performances with other talented folks in Clay's future. Error: Error validating access token: Session has expired on Tuesday, 21-Aug-18 16:13:01 PDT. The current time is Thursday, 18-Apr-19 13:01:38 PDT.